Stash some of this emerald sauce in ice cube trays and freeze. Then add to dishes when your garden full of basil is just a memory. Most people enjoy Parmesan cheese with their pesto. This recipe omits the Parmesan, which can be fresh when you serve it, for optimal flavor. In a food processor, pulse the basil, garlic, and pine nuts until finely chopped. Add the olive oil and process until the sauce is nearly smooth. Taste and adjust salt to suit your tastes, remembering that adding Parmesan later will add saltiness. 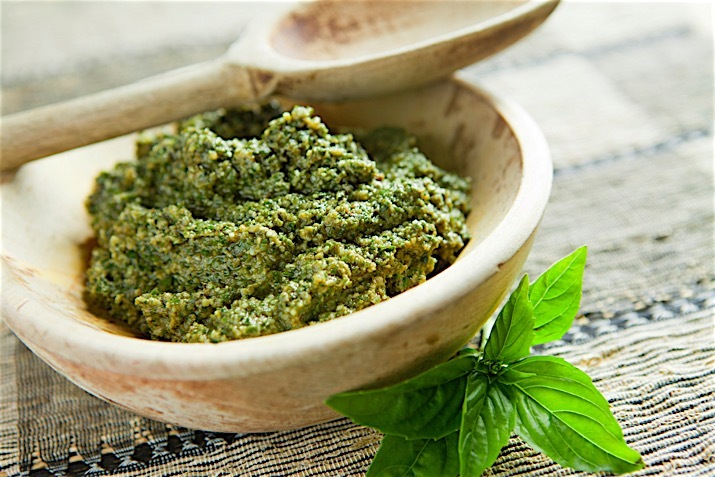 Distribute rounded tablespoons of pesto into the wells of an ice cube tray. Freeze until firm, then transfer pesto cubes to an air-tight freezer storage container, such as a plastic freezer bag or glass Mason jar and store in the freezer until ready to use. Drop cubes into a simmering tomato soup for a burst of flavor or defrost one cube to spread on grilled cheese sandwiches.